So after buying a local seller's handmade soap, I tried it and was elated about the results - softer, smoother, and less irritated skin as it doesn't leave me with a dry and taut feeling. I used to have gross spots on my skin that made the texture feels like chicken skin, but after using this religiously the spots have miraculously reduced ^^ So I began researching about handmade soaps but it's not really big here in Malaysia as it is still a pretty new concept here, unlike in the UK, USA and Australia. Even to get sodium hydroxide (lye/NaOH), one of the ingredients in making soap locally is quite difficult as it is a controlled substance here. Then I discovered a local soap supply and teaching shop in KL, and I eventually signed up for their beginner's soapmaking class. It was a totally fun experience! We were taught about lye safety and handling (coz it burns! ), types of oil and their properties like SAP value, and finally we get a hands-on experience in making two types of soaps - Olive Oil (Castille) Soap scented with Lavender, and Shea Butter & Milk Soap scented with Lavender & Rosemary. I was really happy hahaha. So firstly, soap is made when you combine oils/fats and sodium hydroxide. After learning about different types of oils and how they can contribute to different qualities in the end result of the soaps, we learned how to calculate the amount of sodium hydroxide required for each soap recipe. The sodium hydroxide required is different for every oil combinations in the recipes, so whenever you tweak the ingredients in the recipe, you will need to recalculate the sodium hydroxide amount again. It is a really important step to have accurate amount of NaOH, otherwise with too little of it you will end up with a pile of oily goop and if you have too much of it the soap is unusable coz it will be caustic and burn your skin instead. 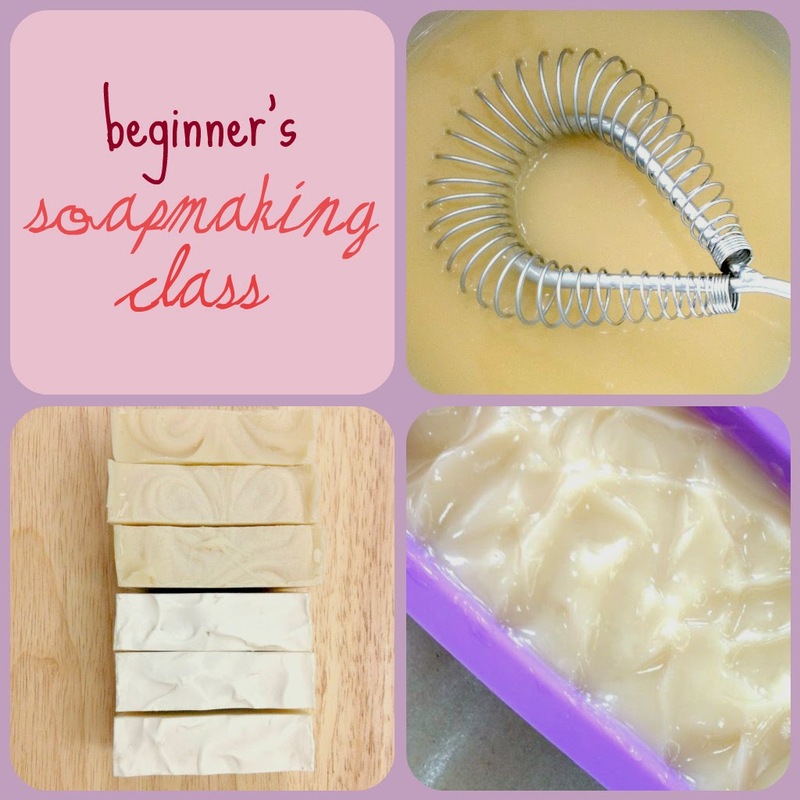 I'll explain more about basic soapmaking in my next post. I didn't take much pictures in class coz I was too nervous till I forgot hahaha. This is the soap batter that results after you add in the lye mixture (sodium hydroxide with water) and oils, and stir it. I wished I had a stick blender or something to whip it up coz it is really laborious. And tadaah... here are my cut and cured bars, ready for use! On the left is Shea Butter & Milk soap scented with lavender & rosemary, and on the right is Olive Oil (castille) soap scented with lavender. Too beautiful for me to use. And now I'm a qualified soapmaker yay! That's all about my beginner's soapmaking adventure. I am excited to embark in the soapmaking journey, this is where you can be entirely creative in concocting your own recipes and techniques. Soapmaking is a very therapeutic thing for me too heheh.